JewishWorldReview.com | In September 2010, six months after signing the Affordable Care Act and just weeks before his party's massive losses in the midterm elections, President Obama wondered whether the law's unpopularity might be due to a communication failure on his part. "Sometimes I fault myself," he told an audience in Virginia, "for not having been able to make the case more clearly to the country." The case for ObamaCare was perfectly clear. But those claims rang false even before the law was passed. Nothing is left of them now � and another midterm election season is underway. Voters rewarded the GOP for standing fast against the law four years ago, and there is a growing sense that they're going to do so again this fall. Obama has been warning Democrats for months that they are likely to "get clobbered" at the polls this November. It's not just widespread disapproval of the president's signature legislation that makes his party so vulnerable � it's the intensity of that disapproval. "The people who favor ObamaCare, which is a minority, aren't really that enthusiastic about it even if they favor it," says political analyst Larry Sabato of the University of Virginia. "But the majority who oppose ObamaCare are much more charged up, and they're the people who tend to turn out" for midterm elections. 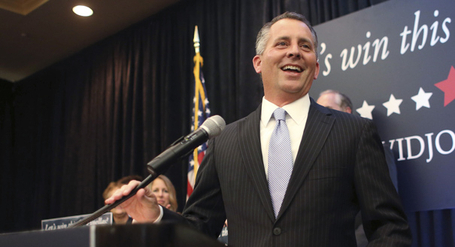 Republican David Jolly, campaigning on a platform to "repeal and replace" ObamaCare, won a special election for a Florida congressional seat this month. That was probably overstating it. Politics is the art of the possible, and even with a slew of midterm pickups, it would be impossible for opponents of ObamaCare to "get rid of it � period." But there is nothing impossible about replacing the Democrats' unpopular monstrosity of a law with alternatives that expand freedom and competition in health insurance, rather than suppressing them. Four years of ObamaCare have shown what arrogance, deception, and top-down control can accomplish. No wonder voters want to see if Republicans can do better.